Free Seminar: Three Top Secret Marketing & Prosperity Strategies Revealed! Three Top Secret Marketing & Prosperity Strategies Revealed! Why are some businesses thriving while others are barely scraping by? What do they know (or do) that you don't? Find out the answers to these questions and more in an exciting and informative preview of the DIY Marketing Center programs, when all three secret marketing and prosperity strategies will be revealed! This info-packed overview will include the essential elements of marketing plans, with examples, ideas, and a take-home template. It's free to attend, but space is limited, so make sure you reserve your place! This free class is presented as a public service by DIY Marketing Center and hosted by Ronnie Noize, the Marketing Coach. Comcast users in Oregon and Washington: If you have trouble getting the website to load, simply register at http://www.meetup.com/DIYMarketingCenter/. Our apologies for the inconvenience. From ribbon-cuttings and holiday parties to seminars and previews, events are powerful marketing opportunities to attract attention from current clients and new prospects as well as generate buzz about your business. You may think the toughest task is handling the logistical details or creating an awesome event experience, but the real challenge is getting the word out and getting people to attend. Here is a short list of steps for getting ready to promote your event, plus over three dozen ideas for spreading the word and creating excitement about your event so that every seat is filled and your marketing mission for the event is accomplished. Step 1: Summarize the key data of the event in a plain text document, such as the title, day, date, time, location, audience, registration details such as cost, reservation requirements and links. Include all important details such as prizes, bonuses, take-aways, special guests, food and beverages (if any) to be available. This data sheet will be the basis of your marketing efforts, including press and promotion materials. Step 2: Develop a creative theme for the event, and carry it through all the copy and visuals in your marketing pieces. This doesn't have to be elaborate; it could be as simple as finding a photo or image that you will use consistently to add a visual hook to your event, like a special logo, photo of the speaker, picture of a past event, or image of something that represents the spirit of the event (such as a Santa hat for a Christmas party). There are lots of images available online at no cost as long as you include attribution, or you can create your own. Don't just grab an image off the internet--that's stealing, unless the image is specifically designated as free. Step 3: Set up your registration mechanism if you're going to use one. I prefer having online registration, even for free events, so that I can send confirmations and reminders to attendees. This also serves to create a prospect list, if that's the purpose of the event. If the event is hospitality related, such as a client-only appreciation event, knowing how many folks are planning to attend helps you be prepared with enough food and beverages. My favorite registration mechanism is the calendar on my website, because it includes a shopping cart to accept payment. If you don't have that available and you are charging for your event, you could use a service like EventBrite, but there are some surprising downsides to using some event registration sites, so think it through and read the fine print before you commit. Do not require a phone call or free form email message for registration; people often feel uncomfortable with that, and you may not get all the information you need to collect. These days, most folks prefer an automated process that responds immediately. Step 4: Add your event to your website's calendar or events page, if you have one. Even if you don't do events every month, I strongly recommend that you have a calendar or an events page on your website, because those are frequently the most-visited pages and are easy ways for visitors to see what's happening at your business. Use the your data sheet and image to create the listing. Post the event on your website where it will be seen. My big events usually appear at least three places on my website: A dedicated event overview page, plus a short listing on my Public Events page, and in my website calendar. Many events will also have an image on the homepage that links directly to the event page. Include a mention of the event to your newsletter (both hard copy and electronic). Send a special (dedicated) invitation by email to appropriate people on your list, such as clients, prospects, power partners, or others. You may want to personalize the invitations by category. Send a hard copy invitation by snail mail. Get creative with this, and make it special. For example, you could send an invitation that looks like rolled up treasure map in a tube. Obviously, this has to reflect the theme of your event, but the more interesting the invitation is, the more likely folks are to notice it and respond. Create a hard copy flyer or postcard to send by snail mail. Distribute your flyer or postcard at networking and association meetings. Leave small stacks of your flyer or postcard in appropriate places, such as a power partner's office, the Chamber, and at your front (reception) desk. Insert the flyer or postcard into your regular mailings, such as invoices. Insert the flyer or postcard into a bag at the point of sale (this is a "bag-stuffer"). Post your flyer or postcard on public bulletin boards at grocery stories, coffee shops, and other retail or community sites. Create a bulletin board version of your flyer with small tear-off tabs with your event title and website info for these places. restaurants, book stores, yoga studios, gyms and other high traffic locations are often open to displaying nice posters. Leave a small stack of postcards at reception as well. Post your event on appropriate public calendars. This may include your industry association or business calendars, community calendars, and more on TV, radio, newspapers, newsletters, websites, and forums. Post an event announcement or invitation on appropriate online bulletin boards or communities. Host a Google hangout to announce the event, and talk about why people should attend. Post the recording on your YouTube channel. Send a press release to appropriate media (usually local is best). Post the press release on your website. Follow up your press release to calls to appropriate media to get interviewed about your event or expertise, and mention your event. It is helpful to have a list of interview questions prepared in advance to make it quick and easy for editors and reporters to agree to an interview. Create an event on MeetUp.com or other community event website. Ask your power partners to help you promote your event with mentions in their newsletters, on their websites, in dedicated emails, insert your flyer or postcard into mailings or pass out at their office, or display your event poster in their windows. Send personal notes with invitations or flyers to power partners, key clients, and influential friends. Create an event image (photo with key details) for social media sharing, and post it on Facebook and Pinterest. Ask your friends to share the post. Create a Facebook event, and invite your friends, colleagues, prospects and clients. Make a short video (use your phone) announcing the event to post on social media. Create a short educational video series of three or four videos that offer a little educational info plus an invitation to your event. Post on your YouTube channel, and share in social media. Run a Facebook ad to a tightly targeted demographic. Write a blog post about your event. Talk about your event while networking. This is the perfect response to the "what's new" question! Print up tickets or passes (even for free events) the size of business cards. Give them to friends, clients and power partners so they can invite their friends. Offer a ticket or registration as a raffle prize at an event. Run a sweepstakes on Facebook and give away tickets as prizes. Create an ambassador program, in which influential people attend for free when they bring a certain number of guests with them. Pick up the phone and personally invite the people you want to attend. Send a broadcast voice message to invite to or remind your prospects, power partners and clients of the event. Offer a Groupon or Living Social deal for your event (this is for large events that have a cost). Offer a gift-with-purchase, extra bonuses, two-for-one, or early bird pricing to encourage early registration. 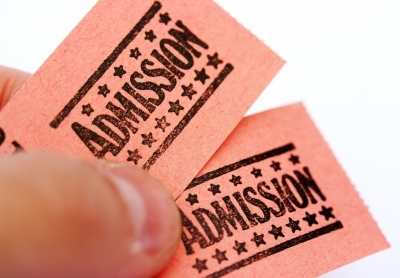 Offer an attendance gift (even for free events) to make sure people show up. This doesn't have to cost a lot to have high value; a code to download your $5 ebook for free would work. Ask registered attendees to post messages on Facebook or your blog sharing what they hope to get from your event, or why they're excited about it. This can be done in the registration confirmation email or message. Ask registered attendees to bring a friend to the event. Give them an incentive to do so, such as a small gift or enter them in an exclusive drawing. Update your blog and social media with new information about your event, such as how many attendees are already registered, what extra content is added, or about special guests. Add a philanthropic element to your event by giving a certain amount of the proceeds or requesting donations for charity. The recipient organization may help you promote the event by adding it to their calendar, newsletter, and sending a dedicated email to their supporter list, among other things. Ask your power partners to donate raffle prizes or bonuses for your event. This adds value to the event, and gives your power partners added visibility to your community. Ask that they announce their participation to their lists as well. Be a walking billboard! Create a T-shirt for your event, and wear it when you're around groups of your target audience. If your event has a high ticket price, host a free preview webinar, teleclass, or onsite seminar to create interest and excitement. Post mini-interviews with special guests that will appear at your event. These could be audio, video or written interviews share via email, social media, blogs, or posted on your website. How to Promote Your Marketing Event (40+Ideas) © 2014 Veronika Noize. All rights reserved.